FurReal Friends brings you pretend pet play with plush animatronic pets that children love. The variety of features that our different pets display can make you want to snuggle, play, and laugh out loud. 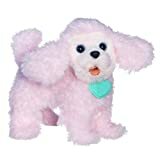 Walkin’ Puppies Pretty Poodle pet is a new FurReal Friends plush puppy that really walks, has poseable front legs, and makes adorable puppy sounds. Meet Walkin’ Puppies Pretty Poodle, an adorable FurReal Friends Walkin’ Puppies plush poodle that walks, like a real puppy! Just pet her back and watch her go. She will respond to your touch and walk toward you. Take Walkin’ Puppies Pretty Poodle with you on the go for tons of fun. This FurReal Friends Walkin’ Puppies Pretty Poodle pet will melt your heart with her cute walk and adorable puppy sounds. When you pet her back, she’ll make sweet puppy sounds as she happily walks across the floor to you. 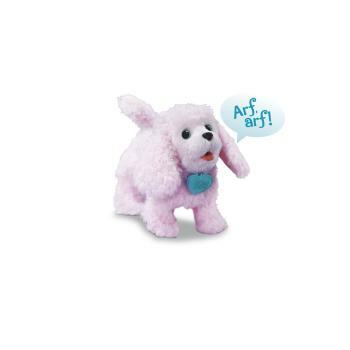 Walkin’ Puppies Pretty Poodle has front legs that are poseable, so you can play with her in all sorts of ways. Her head is poseable too, so you can even turn it to make her look at you! Once you hold and pet this FurReal Friends Walkin’ Puppies Pretty Poodle plush pup with her soft and cuddly fur, you might want to hold her forever. You’ll fall in love with Walkin’ Puppies Pretty Poodle puppy. Walkin’ Puppies Pretty Poodle plush pet and pet care guide.